by one of the Value fields, in Largest to Smallest or Smallest to Largest. If there is NO pivot field to the left of the field that you are sorting, all the pivot items will be sorted together in the order that you selected. If there ARE fields to the left of the field that you are sorting, the pivot items will be sorted within each item of next field to the left. In the screen shot below, the Product field is in the row area, and a product name is selected, in cell A5. When the Z-A button is clicked, the product names are sorted in descending order. In the screen shot below, the Product field is in the row area, and value in the Orders field is selected, in cell C4. When the A-Z button is clicked, the Orders values are sorted in ascending order. In the examples above, there is no pivot field to the left of the product field. In that situation, all the pivot items are sorted together, so you can see the top and bottom values overall. If there is a pivot field to the left of the field that you are sorting, the sorting is restricted by that outer field. The labels or values are only sorted within each of the items in the outer field -- the sorting does not occur overall. In the screen shot below, the Product field is in the row area, and the Category field is to its left, as an Outer field. The Product quantity in cell C5 is selected, and when the A-Z button is clicked, the Qty values are sorted in ascending order -- within each Category. The outer field, Category, can also have its Qty values sorted, independently of the Product Qty values. 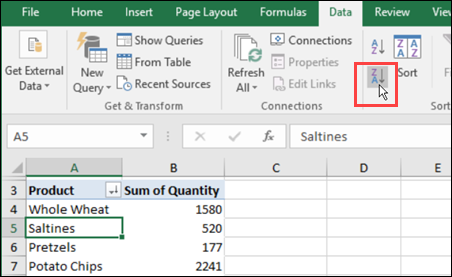 After you create a pivot table, new items might be added to the source data. When you refresh the pivot table, those new items might appear in the drop down lists, at the bottom of the list. Sometimes, the new items don't appear at all, if a filter is applied. 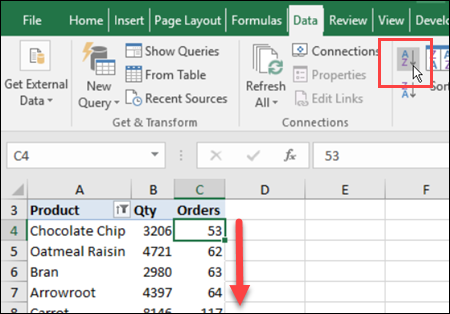 Watch this video to see how to solve problems with new items in a pivot table. When you add new records to your pivot table source data, and refresh the pivot table, new items might appear in the drop down lists. Sometimes, those new items appear at the end of the list, instead of in alphabetical order. For example, in the screen shot below, binders were just added to this pivot table's source data. When the pivot table was refreshed, Binders appeared at the bottom of the Product list, instead of the top. Items in the pivot table drop down lists can get out of order, if the pivot field is set to Manual sort (the default setting). When a field is set for Manual sort, the pivot items are shown in alphabetical order at first, and you are able to drag the pivot items to a different position in the worksheet. Any new items will appear at the end of the drop-down list. Right-click a cell in the Product field. For example, right-click the Envelopes cell. Click Sort, and then click Sort A to Z. 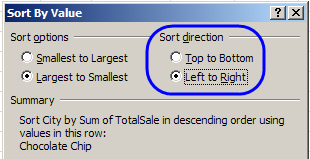 When you sort the Product field, its sort setting changes from Manual to Sort Ascending or Sort Descending. This also sorts the drop-down list, and makes it easier for users to find the items they need. After you refresh a pivot table, new items might appear in the Report Filter drop down lists. If the new items are not in alphabetical order, you can follow the steps in the short video, to sort them. If you add new records to fields that are in the pivot table's Report Filter, any new items might appear at the end of the list, instead of in alphabetical order. You can sort the items in alphabetical order, either manually (as described below), or with programming (get the report filter sorting macro here). There is also a Sort Report Filters command in my Pivot Power Premium add-in. In this example, the Product field is in the Report Filter area, and Binders is a new product in the source data. 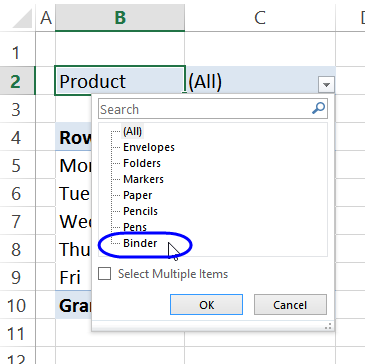 When the pivot table was refreshed, Binders appeared at the bottom of the Product list, instead of the top. If a field is set for Manual sort, new items will appear at the end of the drop-down list. You can't sort the fields that are in the Report Filter area, so move them temporarily to the Rows area. Drag the Product field into the Rows area, above any other row fields. Drag the Product field back to the Report Filter area. Usually you sort a pivot table by the values in a column, such as the Grand Total column. By sorting, you can highlight the highest or lowest values, by moving them to the top of the pivot table. Right-click on a value cell, and click Sort. You can also sort a pivot table row by its values, left to right. 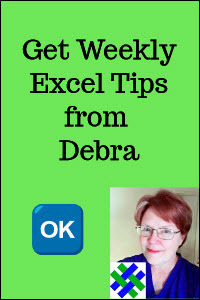 This moves the largest or smallest amounts to the left of the pivot table, so you can focus on them. For example, in the pivot table shown below, the cities columns are in alphabetical order, with Boston at the left. To hightlight the city with the highest sales, you can sort the Chocolate Chip row, so the sales per city are sorted in descending order. 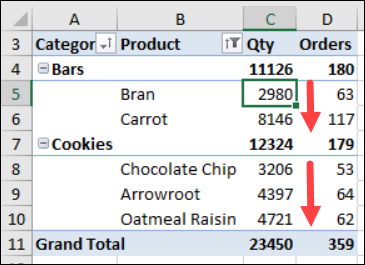 In the pivot table, right-click a value cell in the Chocolate Chip row. In the Sort By Value dialog box, under Sort Options, select Largest to Smallest. Under Sort direction, select Left to Right. In the Summary section, you can see a description of the sort settings. After you sort the Chocolate Chip row, left to right, the values in the Chocolate Chip row are sorted largest to smallest, from left to right. 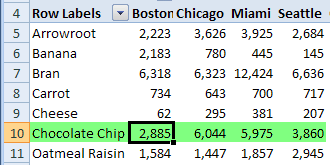 The City column order has changed, and Chicago, which has the highest Chocolate Chip sales, is at the left. NOTE: Rows for other products may not be in descending order, because the column order has been set by the values in the Chocolate Chip row. You can also create custom lists, such as department names or cities, and specify a unique sort order for those lists. 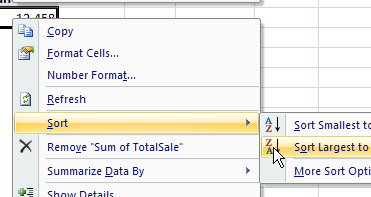 Then, in your pivot table, you can use those lists as the sort order, instead of sorting A-Z. If the field which has items from a custom list is set for Automatic sort, it should change to the custom list's sort order. If the field is currently set for manual sorting, it won't sort according to the custom list order. 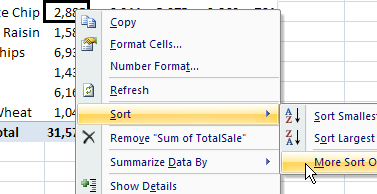 To change it to automatic sorting, right-click a city label, click Sort, and then click Sort A to Z. In some cases, you might not want the custom list sort order used in a pivot table. For example, if a salesperson's name is Jan or May, that name would appear at the top of a list, before other names, such as Ann or Bob. In the PivotTable Options dialog box, click the Totals & Filters tab. In the Sorting section, remove the check mark from "Use Custom Lists When Sorting"
NOTE: This setting will apply to all the fields in the pivot table. The following macro will change the Sort setting to Ascending (A-Z), for all row and column fields, in all pivot tables, on all worksheets, in the active workbook. The sort order is based on the item names, so "East" would come before "West". To sort Report Filter fields with a macro, go to the Report Filter macros page. The following 2 macros will sort all the Row fields in the selected pivot table, based on the values in the "Sum of Total" field. NOTE: Before you run the macros, select any cell in the pivot table that you want to sort. strVal = "Sum of Total"
The following 2 macros will sort all the Row fields in the selected pivot table, based on the values in the selected Value field. At the end of the macro, a message shows which Value field the sort was based on. NOTE: Before you run the macros, select any amount in the Value column that you want to sort by. MsgBox "Please select a Values field"
The following macro will sort the Product field in the Orders pivot table, based on a list in another sheet. The list is named (ProdList). If the sort list contains items that are not in the pivot field, or are not visible in the pivot table, those items will be ignored. Any items that are not in the sort list, but are in the pivot field, will drop to the end of the sorted pivot items. 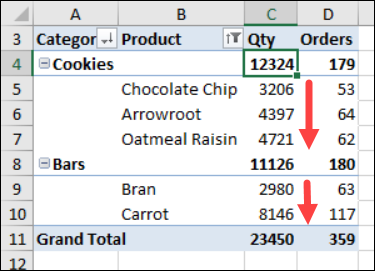 To test the techniques in this tutorial, you can download the pivot table sorting sample file. The zipped file is in xlsx format, and has NO macros. To test the Sort Based on a Value macros, download the Sort Based on Values file. The zipped file is in xlsm format, and contains macros from this page. To test the Sort Based on a List macro, you can download the Sort Based on List file. The zipped file is in xlsm format, and contains macros.